The Beatles will show up on this journey more than any other band or artist as they have a whopping seven albums that have made the cut. I’m excited for every one of their outings as I would definitely consider myself a fan of their work. My father was obssesed with The Beatles when he was younger, so I’ve been exposed to their music since I was a kid. It wasn’t until Across the Universe, the 2007 film that worked Beatles’ songs into a fascinating narrative, that I really fell in love with some of their music, though. 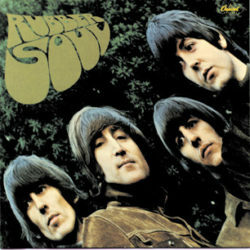 As for the album at hand – Rubber Soul – I also discovered something new: the UK and US releases on vinyl didn’t have the same track listing! So while this was the first album I listened to on vinyl since I own it, I had to supplement my Apple Music subscription to listen to many of the album’s most notable songs, including “Drive My Car”, and “If I Needed Someone”. The introduction of the sitar in “Norwegian Wood” also stands out as memorable. Overall, the album is not my favorite from the Fab Five, but it’s still a classic nonetheless.